Human Chorionic Gonadotropin Injection (HCG Shots) is used for induction of ovulation and pregnancy in the anovulatory, infertile woman in whom the cause of anovulation is secondary and not due to primary ovarian failure, and who has been appropriately pretreated with human menotropins. You can buy HCG injections online from our pharmacy in strengths of 1500 iu, 2000 iu, 5000 iu and 10000 iu. We also have in stock Prega News Home Pregnancy Test Kit which is a urine based pregnancy test that works by detecting the the presence of the hormone hCG (Human Chorionic Gonadotropin) in a pregnant woman's urine. The active ingredient present in HCG injections is Human Chorionic Gonadotropin. Each vial of HCG injection contains 1500 iu, 2000 iu, 5000 iu or 10000 iu of purified Human Chorionic Gonadotropin. HCG Injections (Chorionic Gonadotropin for injection, USP) is a extremely purified pyrogen-free preparation prepared from the urine of pregnant females. This medicine is used to stimulate egg release (ovulation) in women who are not ovulating and in whom ovarian failure is not the cause of infertility. It is used for intramuscular injection and available in multiple dose vials of sterile dried powder.Each package also contains a 10 mL vial of solvent containing water for injection with 0.56% Sodium Chloride and 0.9% Benzyl Alcohol. The dosage of HCG injection has to be administered Intramuscularly. It will depend upon the indication for use, the age and weight of the patient, and the doctor’s preference. The dose for induction of ovulation and pregnancy in the anovulatory, infertile woman in whom the cause of anovulation is sec ondary and not due to primary ovarian failure and who has been appropriately pretreated with human menotropins is 5,000 to 10,000 USP units one day following the last dose of menotropins. Each vial of Human Chorionic Gonadotropin Injection (HCG Shot) is sold along with a vial of sterile diluent containing 30 mL of bacteriostatic water for Injection USP, containing 0.9% benzyl alcohol. Human Chorionic Gonadotropin Injection are contraindicated in patients with Precocious puberty, prostatic carcinoma or other androgen-dependent neoplasm, prior allergic reaction to HCG. HCG can cause fetal harm when administered to a pregnant woman. Combined treatment with HCG/PMS (pregnant mare's serum) has been observed to cause high incidences of external congenital anomalies in the offspring of mice, in a dose-dependent manner. The possible side effects of Human Chorionic Gonadotropin injection include Headache, irritability, restlessness, depression, fatigue, edema, precocious puberty, gynecomastia, pain at the site of injection. Hypersensitivity reactions both localized and systemic in nature, including erythema, urticaria, rash, angioedema, dyspnea and shortness of breath, have been reported. The relationship of these allergic-like events to the polypeptide hormone or the diluent containing benzyl alcohol is not clear. 1. Induction of androgen secretion by HCG may induce precocious puberty in patients treated for cryptorchidism. Therapy should be discontinued if signs of precocious puberty occur. 2. Since androgens may cause fluid retention, HCG shots should be used with caution in patients with cardiac or renal disease, epilepsy, migraine, or asthma. There have been sporadic reports of testicular tumors in otherwise healthy young men receiving HCG injections for secondary infertility. A causative relationship between HCG and tumor development in these men has not been established. The acute toxicity of urinary gonadotropin medications has been shown to be very low. Despite this, there exists a possibility that too high a dosage of hCG can lead to ovarian hyperstimulation syndrome. Human Chorionic Gonadotropin Injection has been classified by the US FDA as Pregnancy Category X. Do not use this medicine without your doctor's consent in case you are pregnant. Stop using this medication and inform your doctor immediately if you become pregnant during treatment. Combined HCG/PMS (pregnant mare's serum) therapy has been observed to cause high incidences of external congenital anomalies in the offspring of mice, in a dose-dependent manner. The potential for causing similar effects in humans has not been determined. It is not known whether Human Chorionic Gonadotropin is excreted in human milk. Because many drugs are excreted in human milk, caution should be exercised when HCG injection is administered to a nursing woman. You can buy HCG Injections online from Clear Sky Pharmacy at a cheap price. Human Chorionic Gonadotropin Injections are supplied in a package containing 1 vial and 1 solvent. 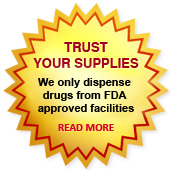 The 2000 iu injections cost only $17.17 per unit when you place an order for 18 injections.